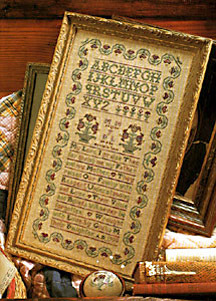 Parents Sampler was published in the Spring 2001 issue of Sampler & Antique Needlework Quarterly. Giulia got the inspiration for this sampler from reading previous issues of the magazine. She says, "This project is a love tribute to my parents: a very old-fashioned band sampler with a flower border and two vases with lilies. The pistils of flowers are realized with golden beads and yellow silk. The sampler is designed to match the previous two projects that I designed." Fabric: 40 cts Natural unbleached Linen of Scarlet Letter. Stitch count: 158 x 316. Stitches: Cross stitch, satin stitch, back stitch, four sided stitch, closed Herringbone stitch, Montenegrin stitch, Queen stitch, Eyelet stitch, Smyrna cross stitch, Long arm cross stitch. Caron Waterlilies: Meadow, Evergreen, Amethyst, Midnight. Needlepoint Ink Silk: Wine Red.